From concept of the artwork created by our in-house design team, through prodcution to shipping the final product, we work side by side with each client to ensure the accuracy of every detail. We use the latest technology in our screen printing production ensuring high quality prints with a variety of inks to ensure your design looks it's best every time. Unless we receive detailed instructions from you specifying an artwork size, our artists will use best judgment to size your artwork to the specific garments of the order. The artwork size that will be used is specified on the artwork proof and your responsibility to confirm during the approval process. 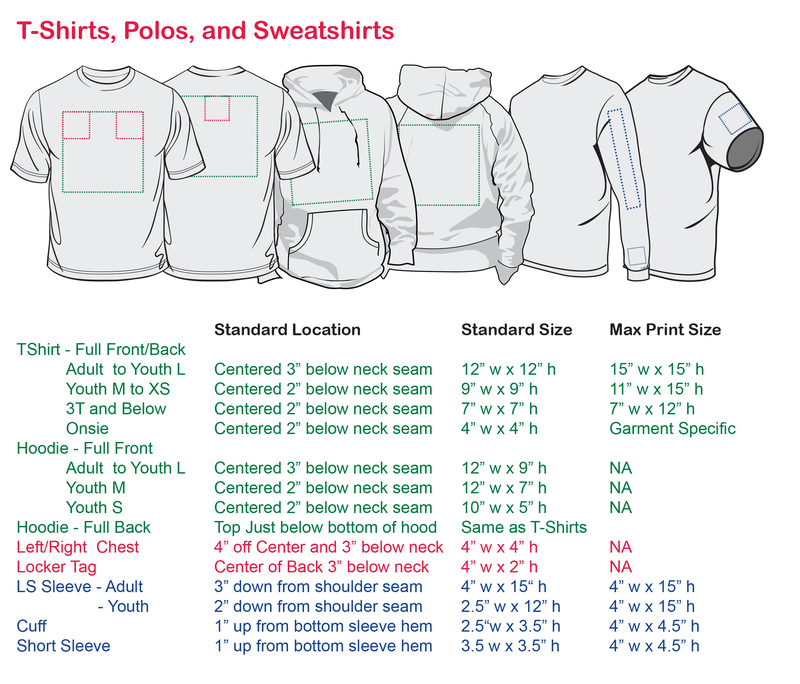 Orders with different garment sizes have two options: A) Use the smallest garment to dictate the artwork size on all garments, or B) Create separate artwork sizes. This is most common when an order has adult and youth garments. If we create multiple artwork sizes, each artwork size is counted and priced as a separate order. Unless we receive your specific instructions indicating otherwise, these pages show the standard size and location that we will decorate your garments. Note: we always keep your artwork height and width proportional. Usually one dimensions reaches standard or max size before the other.